Much like Sean O’Brien, Josh Palma is another one of those wakeboarders who actually comes from Orlando, but doesn’t have a water skiing or show skiing background. Josh just happened to grow up on a lake and get into wakeboarding because it was something fun to do. For the last four years, though, Josh was focused more on finishing college and getting a degree than riding a wakeboard, so not too many people outside of Orlando know who he is yet. Just last year, after he graduated and could devote all his time to wakeboarding, Josh blew his knee riding and missed a lot of water and would-be-exposure time. This summer Josh came back strong, and after becoming Hyperlite’s first ever head-to-toe rider (Josh is endorsing Hyperlite’s new clothing line, along with their boards, vests and accessories), is poised to make a name for himself in the industry as both an extremely talented rider and one of the nicest guys out there. Alliance: Let’s get the basic info: name, age, home. Josh Palma: Josh Palma, 22, Maitland, Florida. A: How’d you get into wakeboarding? JP: I was at a Rollins basketball camp when I was about 11 and Joel Cahill invited me out to take a shred on the HO Perez directional skurfer with the old bungees on it. Then I kept riding with him and a few months later I got a board and I just started riding a bunch. A: Did you ever see Chase (Heavener) and the whole New Crew riding on Lake Maitland back in the day? JP: Yeah, we would ride out there when Chase had his boat with the Arnette skull on it. 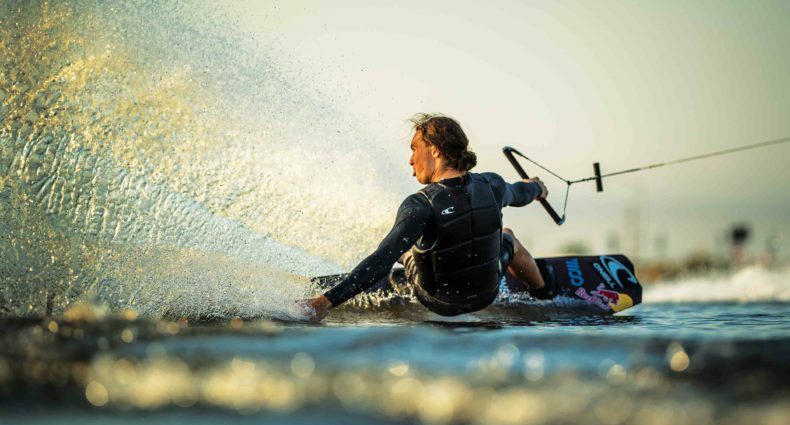 We’d see Chase, Staker and Thomas when they all used to wakeboard. A: What are you doing now that you’re done with college? JP: I just finished getting over my knee injury and got things sorted out with Hyperlite and helping them launch the new apparel line, which is awesome, and I’ve been coaching a lot around town. The Hyperlite thing has been a lot of fun, though, ‘cause I’m getting involved with things like product development and writing and I really like doing that. It’s a lot of fun being involved with something more than just as a rider. A: What happened with your knee and how long did it take to come back? JP: The timing was definitely a bummer because I’d just graduated two months before and I’d put off wakeboarding really seriously until I was done with school. I was out west in mid July of last year for a little Hyperlite team trip before the Portland stop and was doing a half cab front flip and completely tore my ACL. I had surgery in middle of August and had to rehabe for about seven and a half months. I finally got back on the water around February and then was able to compete at Atlanta and do the PWT this year. A: What was it like being on the PWT this year? JP: I had a lot of fun gaining more experience and being a part of it because I’d never been a part of the competitive scene before. It was definitely a little frustrating because I felt like I was having to play catch up after my injury and coming back, but it was still a lot of fun to be a part of it. A: Do you like riding in competitions? JP: I’m a competitive person, so I like competing and trying to do well, but I’d definitely like to see some changes made to the wakeboarding competition scene. I just think there needs to be a little more diversity in the riding, and that some diversity and creativity should be rewarded more. A lot of times a competitions you’re just watching the same thing over and over and I think some things could be done to change that. A: Whom do you normally ride with? JP: I ride with Jeff McKee a lot, we both went to Rollins together. I ride with Travis (Moye) and Shaun (Murray) out at the Boarding School a lot, too. Plus I’ll ride with other Hyperlite guys a lot like Rusty, JD and Rathy. And I’ve still got a few friends at Rollins who ride, so I’ll head out with them, too. A: Jeff McKee wants to know if it bothers you that people call you the only black person in wakeboarding when you’re not black? JP: Nope, but Travis Moye dubbed me Chocolate Rain. He’d e-mailed me the YouTube video one night and then he just started calling me it. A: How’d you learn so much switch stuff? JP: What’s weird is that prior to wakeboarding I was really into baseball and I was kind of ambidextrous. I’ve never really had a dominant side, so I think it really helps out with my switch riding. I think I actually rotate more naturally switch, but I started riding left foot forward, so I’ve just learned to do things both ways. I’d always watch snowboard and skate videos and I liked how they wouldn’t have to ollie around back to regular to set up for the next trick, they would just flow with whatever foot forward they landed. I think that’s one of the key things that’s often overlooked in wakeboarding. Putting together a good, clean line where you don’t have to constantly do ollie 180s to get a certain foot forward takes a lot of talent and creativity. That’s one of the things I definitely notice a lot when I watch other people ride. A: What are your goals for the next couple years? JP: Mainly I’d like to just continue to work on all facets of my riding: photo shoots and video shoots. When I was in school I didn’t have much time to do that kind of stuff, but I love doing it and now that I’m done I want to get into it a lot more. In addition to that I’m really pretty competitive and so I’d like to continue to progress in terms of competing on tour and some other contests that are pushing different formats in stuff. I’d just like to get my riding to where I feel I’m capable of doing a lot of things because this is my first time I can focus solely on wakeboarding. A: Let’s hear the thank-you’s. JP: First off, God, my family and all my friends who’ve helped me with my riding and everybody at Hyperlite for backing me and helping me get through this past year. I also gotta thank the rest of my sponsors which are, Ambush/Buywake, MasterCraft, Oakley, GM/Vortec, Accurate Lines, and Asterisk knee braces.